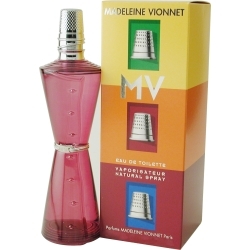 In 1998, Madeleine Vionnet introduced Madeleine Vionnet MV perfume for women, with a unique blend of tropical, woody, floral, sweet, fresh, and fruity notes that give it a pleasing, spicy oriental scent. The intense fragrance is best suited for evening use, so spray it on before you head out for an evening on the town or a date with someone special and feel confident that this long-lasting perfume will stay with you throughout the night. Goodness gracious,what a gorgeous fragrance. I remember seeing the bottle at a store many years ago,but never knew the name of the fragrance and sadly,that store closed down. Now,I've found it again and finally gotten the name and it's MV by Madeleine Vionnet. Longevity is excellent but the only con is it's so hard to find. This will be reserved for all special occasions only.